We had been planning to go to the marine national park for quite some time, but somehow it was not working out because of high tide timings and sometimes due to our laziness. 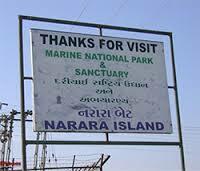 But finally I kept aside my comfort zone one early morning, and head towards Marine national park situated just 60 km away from Jamnagar towards Narara on Dwarka-Jamnagar Highway. The place offers exotic sightings and is spread in an area of 162.89 Square Kilometers and 457.92 Square Kilometers of Marine Sanctuary in the Gulf of Kutch at Jamnagar. This is kind of a rarest place where one can see the coral life with naked eyes without actually diving into the sea. The water level in which you have to walk is just 1-2 feet high. Untouched from the human attention, this place has a unique touch; you can experience the fascinating underwater lives. If you are lucky, you can get a chance to spot octopus, puffer fish, sea turtles, a variety of crabs, dolphins, ray fishes, jellyfish, starfish, colorful corals, exotic marine plants, etc. Our guide’s name was Jafar Bhai (every male referred as Bhai and females as ben in Gujrati). After taking tickets, giving guide charges and waiting for almost 2 hours for the tide to get subsidies, we entered to around 10 -12 Km long stretch with only 1-2 feet height of water and, trust me, it was worth waiting. Be ready to walk around 4-5 Km for 3-4 hours to witness the unique aquatic life. 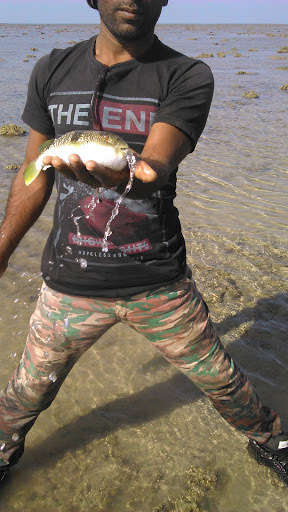 There we found this most unique and cute fish, called Pufferfish. It swells up when put inside water and looks very cute. As soon as you take it out of water; it spits all the water from her mouth. This marine national park is quite isolated and underdeveloped, so it is advisable to keep the guide’s number handy. You cannot find any food joints except a small tea stall at the entrance. 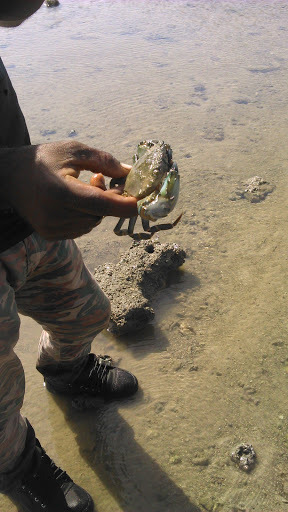 It is advisable to call and check the low tide timing from the guide before visiting this place. There are around 4 tides in a particular day. Two high tides and two low tides.High tide occurs in every 12 hours. The Coral walk is done in the dry spell between 2 high tides. Generally, it takes 3 and half hours for the tide to reach the highest point at Narara on any given day. 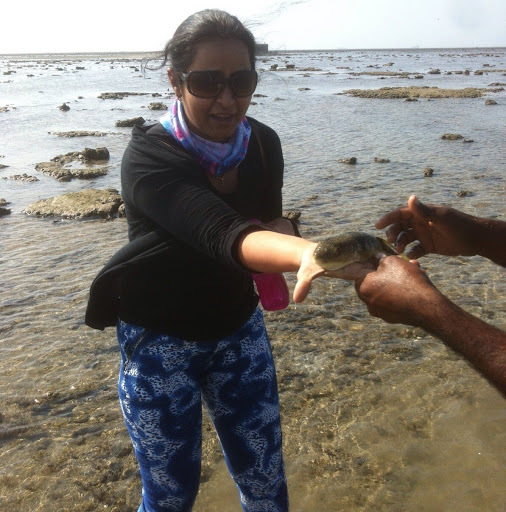 I would suggest hiring a guide which is a must for this trip otherwise you hardly spot any creatures by yourself.